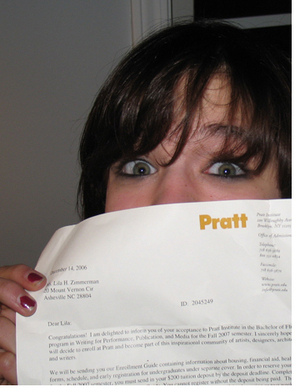 My daughter, Lila just received her acceptance letter to Pratt. She'll be entering the creative writing program there as a freshman in fall, 2007. This is pretty big news around here for a few reasons. One is that she was born in New York City and has wanted to go back since I hauled her down South when she was 4 years old. The second is that it's the only college she applied to. The last reason is that it gives me pretty solid bragging rights, which is cool for dad. Proud pop. She's rockin it, solid. My Alma Mater! Hooray for Pratt! I loved it there. Send her my congratulations, it's a great school. Oh, and have Gothard and Joe Smith look after her. O'Brien is teaching there soon too. Poor girl, followed around by Dad's Drawger gang. Aw-w-w, that's great news, Pop. I'm the dad of a recently graduated daughter, so I know how it feels to have a daughter be in the kind of environment that makes her happy. Congratulations Zimm and Zimmette! As Edel said, I'm giving it a whirl in a couple of weeks. She will wilve in Brooklyn, no doubt, so PLEASE use us as a contact, safe house. We are minutes away. Laundry, a meal or a place to crash whenever she needs it. Tim Oh, and the rest of my house is clean, not like the state of the studio. My 12 year old says she wants to go to Harvard. What's up with that? Man, I got some work to do! Congrats Zimm AND Lila! Congratz to the sprout. New York is gearing up for her arrival! Great news!. Congratulations Lila! NYC, Pratt! This will be a great adventure! Thanks all! When Lila came home with her letter, she literally ripped the front door knob fixture straight out of the socket. So, I am on my way to Home Depot to buy a new one. Lila has read all comments here and has already mentioned "laundry" several times. Watch it Tim, this girl has CLOTHES. Congratulations from a former Pratt grad and Pratt area resident. She's going to love it! Yahoo! Way to go, Lila!! I hope she has all the fun and adventures she can stand. And she fits in some time to learn a few things on the way. Yippee! Zimm, That's great news. What a great adventure, to be young and off to NYC. My 13 year old son Ian is expressing interest in following in his dad's footsteps and I told him New York art schools are the way to go. New York Zity, watch out here comes another Zimm! Congratulations Lila! Zimm- As you most likely know (since I believe I've mentioned it somewhere in the realm of one million times) The Wacksman Compound is located a scant 2 blocks from Pratt. We have running water, heat and air conditioning, full laundry facilities, color TV with cable and locking doors and windows. Local calls are free and Thursdays are "Underage Ladies Drink Free" until midnight. Please, PLEASE, if your daughter ever needs anything tell her to make our home her first stop. We'd be more than happy to help her in any way possible. As an Ohio boy plunked down in the middle of NYC to attend Parsons in '86 I can recall how daunting an experience it can be. Can I have her room?